I am writing to you to advise that it has become necessary to discontinue using the electronic funds transfer (EFT) service that facilitates your donations to be automatically deposited to the church’s bank account. This change became effective December 31, 2017. The reason for this decision is due to the fact that the monthly fees charged by the vendor to perform this service have increased significantly to the point where we cannot justify continuing the program. After reviewing fees schedules of competing vendors, I find no major differences in the fee levels charged by vendors providing this kind of service. Fortunately, we have a “free” alternative! Many of you are familiar with using an online banking application to pay bills. So, it’s just a matter of creating a new “payee” for the United Methodist Church of Merced. You should be able to setup the new payee to make a “reoccurring” payment on whatever time cycle you choose. When you create this transaction, your bank generates a check that gets mailed to the Church. It’s that simple! You don’t incur any fee and neither does the Church! It’s more important than ever that we be good stewards of our own financial resources, as well as those of our Church. Please feel free to contact me if you have any questions about this change. It will be very important that you get your new online banking reoccurring pledge donation setup to correspond with your first donation for January 2018. If you haven’t already turned in your 2018 Estimate of Giving Card, please do so as soon as possible. 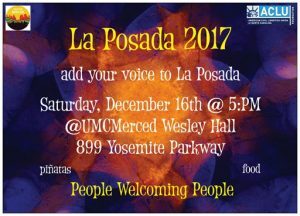 La Posada is the Storybook Christmas that opens every heart to the miracle of Christmas. The village of Bethlehem doesn’t know that it can be open to pilgrims from far away places. They turn away a young family in need of shelter and security time after time until the miracle of welcoming is born in the hearts of the community. In this sacred moment, a savior is born – Christ Jesus. December 17 – 6:PM – Community Christmas Dinner – Wesley Hall Join us in celebrating Christmas dinner with our neighborhood friends. Bring a friend and a dish to share or simply join us for food, fellowship, and God’ Grace. December 21 – 7:PM – Blue Christmas/the Longest Night – Sanctuary The holidays aren’t always a joyful time for everyone. Those who are mourning, lonely, or alienated may find comfort and acceptance in this service of hope. December 24 – 10:AM – Christmas Morning Community Worship – Sanctuary – Welcome the arrival of the Christ child with songs of praise and adoration! Christmas Eve – December 24 – 5:PM – “New Star” a Children’s Candlelight Program – Sanctuary – The story of New Star presented by the children of our community. Old Star tells the younger New Star all about the First Christmas where it is learned he was the original Christmas Star. Along with New Star, we learn that Jesus Christ is the true reason we celebrate Christmas. Mattie’s Tea Room where you can purchase pie, cake, coffee & tea & spend time with friends. Lunch begins at 11:30 in the Wesley Hall. For tickets please call Joyce at 209 617–8119. Help completing applications for DACA (Deferred Action for Childhood Arrivals) & citizenship. Childcare will be available for both days. Stay tuned! More details will be available soon. Meanwhile the. 2017 Peace Camp Registration Form is available here. 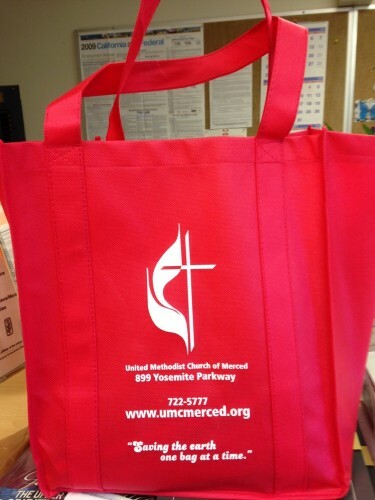 The Welcome Team is selling bright red tote bags with our Church’s name for use instead of plastic bags. 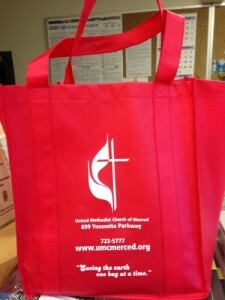 This way you are able to let people know about our church and ‘save the earth’ – one bag at a time. The cost is $5 for a large bag with dual reinforced 20″ handles and a plastic bottom insert. They are available at the Laurel Street entrance. If you are writing a check please note the memo “earth bag”. Thank you for supporting your earth and the Welcome Team. United Methodist Women Scholarhip Applications are now available on the shelf in the Fireside Room. This scholarship is awarded to a who has been away from learning and wishes to return to college. Deadline to apply is August 1, 2014. Download the 2014 UMW Scholarship Guidelines & Application. Two years ago our church held this fundraising event and it was such a great success . . .we’re planning to do it again on Sunday, April 27th. 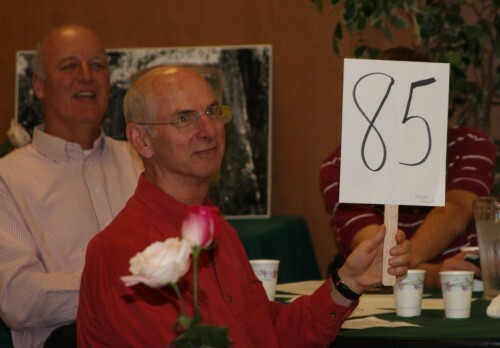 You are invited to the Wesley Hall for our 2014 All-Church Service Auction and Potluck directly after worship (approximately 10:45). Lots of fun, lots of fellowship, and lots of money raised to support our church’s missions both here and around the world. We will also tithe – 10% – made from the auctions will be our gift to “Imagine No Malaria” a UMC project to provide mosquito nets for individuals in sub-Sahara Africa where children die every minute from malaria. We will also be having a Silent Auction and an Opportunity Drawing. How can you be entered in the drawing you might ask? Just attend worship on Sunday and you will receive a ticket to deposit in the cans. There are movie tickets, Panera gift meals, and 5# boxes of almonds are the prizes available to win from the drawing. Start thinking now, brainstorm, plan ahead. What can you offer as a service to the auction? Some favorites from before included cookie of the month, preparing your specialty meal for a group, lessons, vacation stays, driving, house cleaning, sewing, yard work, tax preparation, car maintenance, face painting, and much more. Be creative and imagine something you can do or make or offer (for free) that others would bid on. For more information, to offer your service, to offer to help in the many ways that will be needed contact: Joyce or Larry at umclarry@sbcglobal.net, or Mike & Kelly at kellybentz@sbcglobal.net or Jim & Gwen at bagpipemarshall@comcast.net.